This could be the most confusing card ever and it has nothing to do with grammar. Granted, the name Calvin Coolidge Julius Caesar Tuskahoma McLish is pretty darn cool. He was obviously named for a president, a Caesar and a town in Oklahoma. What’s more, a guy with that many names actually had a nickname and it had nothing to do with any of his given names. He went by Bus or Buster according to his Baseball Reference page. And, according to Wikipedia, his name was so long because his father was given the honor of naming him and he didn’t want to waste the opportunity. Sounds like a good strategy for never getting to name a child again. I can’t really see anything, other than his name, that would make McLish an overly important or interesting player though. The only person on his similarity score I know is Bill Swift – although, through his 34th birthday, he was most similar to Mike Bielecki. He was purchased or traded six times, but the only notable player involved would be Billy Martin. He finished with 6.1 WAR with more than half coming in 1958, when he came in 14th in MVP balloting. He had a 4.01 career ERA and 1.29 K:BB ratio. In short, there was nothing special about him that would inspire his namesake to be on the back of Tony Oliva’s baseball card. 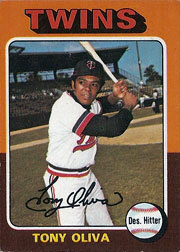 An additional confusing thing about the card is that I didn’t realize Tony Oliva went by Pedro or “(Lopez)”. 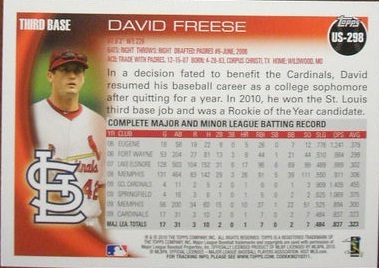 Of course, he went by Tony (he signed the front card as such) and it is listed as his first name…not Pedro. Oliva was, in fact, born Antonio Oliva Lopez Hernandes Javique, according to Wikipedia. So I can understand where the Lopez came from. But where did Pedro come from? If you go to the Tony Oliva official website, there is an entire section on his real name. Apparently, when Oliva initially tried out for the Twins, he was 21 and they thought he was too old. So a friend told the club Tony was, in fact, his younger brother Pedro, who was only 18. The real Pedro did not come to the United States until 2002. So, when you get down to it, both McLish and Oliva have quite distinguished and long names. 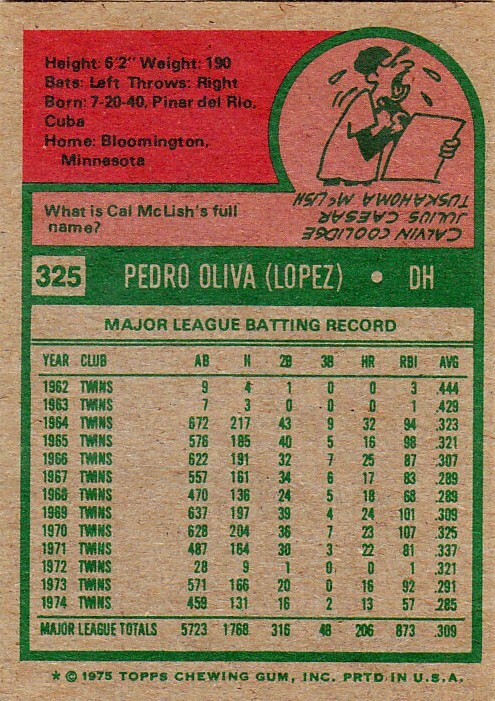 I bet McLish hopes their careers were more similar, as Oliva was worth 42.4 WAR over his career. Oliva also lead the league in hits five times, won rookie of the year and finished second in MVP voting twice. Maybe the trivia question should have been: what is Tony Oliva’s full name?